Maya Memsaab is a 1993 Indian Hindi film directed by Ketan Mehta. The film is based on Gustave Flaubert’s novel Madame Bovary. 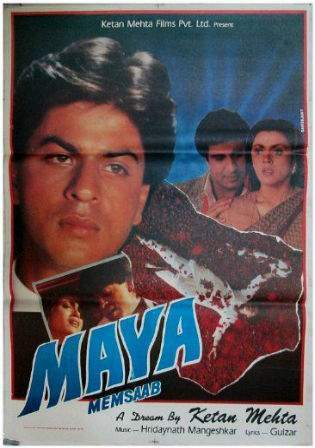 Maya Memsaab won the National Film Award- Special Jury Award / Special Mention (Feature Film) in the year 1993. Young, beautiful and intelligent Maya (Deepa Sahi) lives with her father in a palatial mansion in rural India. When her father suffers stroke, she calls for local Dr.Charu Das, who arrives on his bicycle and prescribes treatment for her father. He comes pretty often, more on the pretext of seeing her than her father. Eventually they get married. Years pass by and Charu is engrossed in treating patients, leaving Maya alone to reflect on her own fate and life. And it is not long before a young man named Rudra enters her life and an affair follows. This does not last long, as a much younger man Lalit (Shah Rukh Khan) now enters her life and they begin a passionate affair. Finally reality catches up with her. Lalaji brings court order to take possession of her house. Her friends (Rudra, Lalit) desert her and it is perhaps this that leads to her sudden death, leaving two investigators to probe who or what really killed Maya.